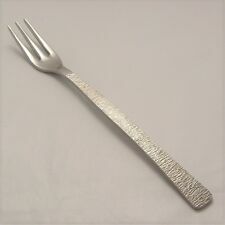 STUDIO Design VINERS OF SHEFFIELD Stainless Steel Cutlery Dessert Fork 7¾"
CORINTHIAN Design FAIREST Sheffield Stainless Steel Cutlery Dessert Knife 8¾"
BEAD Design SHEFFIELD Stainless Steel Cutlery Tea Fork 5½"
EPNS EXTRA. Set of 6 Cake /Pastry Forks. Sheffield, England. An elegant set that will enhance any dining table setting. Approximate boxed weight: 451 grams. The spoon has been assayed by Cooper Brothers & Sons Ltd in Sheffield during 1924. Sorry but there is no Buy It Now price available. A good set of 6 side / dessert / butter knives made of stainless steel in the Mosaic design made by Viners. A good set of 3 tea spoons made of stainless steel in the Mosaic design made by Viners. They have only had a quick clean and would probably benefit from further cleaning. WEIGHT - 36.35 GRMS TOTAL SILVER WEIGHT. SIZE LARGEST SPOON -130 MM LONG. Royal Doulton Cutlery Set. A Royal Doulton 4 piece cutlery set. These are attractive cake / fruit knives and forks. The knife blades are marked Apis unstainable. There are 6 forks and 5 knives. The case is lined in blue satin. The outer case has a few minor scuff marks mainly in the corners. All good condition, plating good. signed £11.70. Set of six soup spoons and set of six dessert spoons, all by Walker & Hall, bearing in their maker's marks the world-recognised pennant with their initials, along with "W & H S" (Walker & Hall Sheffield), "A1" (best quality) and lower case letter "d" (maker's letter for 1922). A set of 5 round end table/butter knives with Firth stainless steel blades, made by the Sheffield Silver Plate & Cutlery Co. Ltd, active at the Globe Works, Green Lane, 1877-1898. You are bidding on a set of vintage pre used Made in England Plated Cutlery. They are not new they are pre owned they come as found with minor surface scratches but in very good clean condition There are 6 Dinner Forks 6 Dinner Knives 6 Desert Spoons & 6 Tea Spoons please see all the pictures of the actual items it helps with the description. All the Cutlery have a Monogram I’m not sure what it is. They all match. The knife blades have a serrated edge & are in excellent condition. No reserve. Postage price is for the U.K. only. Set of teaspoons in old english pattern Firth Staybrite Good/light used condition Ref D236. Made by William Rodgers Sheffield. I am retired. I live just outside Lincoln. Its always great to talk. A very delicate item. Finally [if you have got this fa r!]. The pattern can be seen from the photograph. A nice floriate design with rosette prominence. The handles in the very popular square 'deco' shape are faux bone. In good, used condition with just normal surface wear. Boxed set of six cake forks decorated with blue flowersand gold detail.the box is a bit battered but the forks are perfect. Ideal for your cream teas to set of your lovely china. In their original box and although the box is a bit bashed etc. It would seem that the spoons have been used very lightly, if at all. Good mixture of twenty six dinner knives etc. by various makers inc. Coopers, Pearce, Walker & Hall, Monogram, Taylor etc. I imagine these are of composite materials e.g. Ivorine. Beautiful set of 6 "Crusade" cake cutters with stunning mother of pearl handles complete in original box. Firths stainless steel. These cutters are approaching antique being manufactured by Crusade of Sheffield in the 1920's. VINERS LOVE STORY. Steak Knife. Vintage mixed lot of 53 items in stainless by various makers. Includes many matching and sets Good/used condition. Mustard spoon marked Morton. souvenir tea caddy spoon from the Isle of Man. Mid-century modernist design. A rare find. I have seen the forks listed but never with the partnering spoon. As per images - good clean condition - 6 tea spoons designed by the above for Viners, each approx. 5"/13cms long. All in good condition and certainly ready to use. A rare find in this condition. Get images that. The forks are made by master silversmiths JG Graves of Sheffield. There is no plate loss on these splendid forks which are a joy to handle. I am retired. I live just outside Lincoln. Its always great to talk. This set of 6 VINERS SPLAYDS forks BY MC ARTHUR 18/8 IRELAND are in excellent used condition. A Job lot of faux bone handled knives & forks cutlery. 9 forks & 33 knives. One box has lost a clasp. A sweet little fruit knife and fork in their own pouch. Condition is Used. The knife shows deterioration but is still sharp. I don't know what they're made of, but a magnet sticks to them. SET OF SIX YEOMAN PLATE EPNS CAKE FORKS(13cms long)IN ORIGINAL BOX. Set of 6 Vintage Art Deco Afternoon Tea Knives by Thomas Turner & Co Sheffield. Still in the original box and three still in their original tissue paper. Would probably require a quick wash but otherwise ready to use. The famous sculptor and designer John Poole was commissioned by Viners to design and produce the modern sculpture on the front of the box. Set of 6 Vintage BUTTER KNIVES - FIRTH STAINLESS STEEL in Case - EXCELLENT COND. Condition is Used. Dispatched with Royal Mail 2nd Class. 52 pieces of Viners 'Profile' design cutlery in good usable. Comprises of:-. 5 fruit spoons. 6 soup spoons. 6 desert spoons. 5 desert forks. OLD ENGLISH Pattern Vintage Stainless Steel Six Table / Dinner Knives 9¼"
OLD ENGLISH Pattern Vintage Stainless Steel Twelve Table / Dinner Knives 9¼"
Job Lot of Vintage Cutlery! Caddy Spoons etc- See Pictures for Details. Dubarry Design Royal Doulton Sheffield Stainless Steel Cutlery Coffee Spoon 4⅝"
York Design Sheffield Stainless Steel Cutlery Table Knife 9⅞"